Exchange Server log files maintain the record of every transaction made In or Out of Exchange server. They retain the integrity of data stored in the database to help in case of some service interruptions. Moreover, log files are only responsible for any modification made in the message or email file. So, when a user experiences the loss of Exchange log files with “Exchange log files are missing” statement then the “Operation is terminated with error 528”. This error causes various trouble to the user and also affect the database. The user can also experience Exchange database corruption and file inaccessibility. Hence, the current log files are missing error can be catastrophic and needs to deal with great precautions. What leads to the Exchange Error 528? “Operation is terminated with error 528” – Exchange log files are missing is causes due to a number of reasons. By taking some measures, this issue can be avoided. Improper installation of any malware or software can result in this error. Currently running logs files will automatically get deleted in case of sudden power failure while using an Exchange server. Installed antivirus programs on the machine can also result in Operation termination with error 528. This is due to improper virus software configurations. After “Log files are missing” error is encountered, the Exchange database might get compromised. Corrupted Exchange files will further cause inaccessibility and loss of data. In this situation, it is advised to use an expert tool which will help you overcome this scenario. A user can use a recover Exchange log file utility to repair and restore deleted transactions logs with efficiency and accuracy. Otherwise, to troubleshoot the error, some solutions are also proposed in the further section of the blog. These methods include some manual procedures to fic Exchange error 528. “Operation is terminated with error 528” current log files are missing, results in two type of situations. One is when the database is corrupted and one when it is not. Therefore, according to the situations, the methods are used. This method is preferred when the Exchange database is not corrupted but still, the “Log files are missing”. You need to follow the exact same step to resolve the error. Firstly make sure that antivirus software is configured properly with Exchange server. To so do, you can view the Quarantine Program and verify that the option is enabled. As if is not, then all the log files are virus infected due to which the server deleted them for security reasons. On removal of all Log files, now you are left with res1.log, res2log & e00.chk files. Finally, restart the Exchange services. Use this solution when you are facing Exchange database file corruption. It includes the use of inbuilt utility to repair the database. 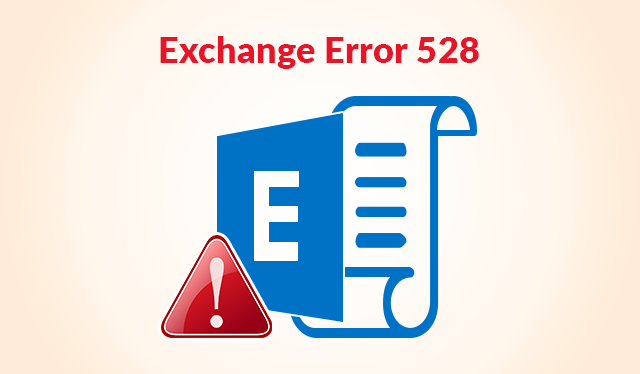 You can repair the entire database when you are facing Exchange error 528. To do so you can use Eseutil /p command. This command will repair the corrupted Database files and will create some white spaces during the process. Therefore, you need to further use Eseutil /d command to defragment the database. This command will free the memory with white spaces. This is another approach used to repair corrupted Exchange database files. In this method, you do not need to dismount the database to repair it. By keeping the database online, the full recovery can be performed by using the following command. “Operation is terminated with error 528” current log files are missing issue can be resolved using the discussed solutions. But the use of manual methods is only suggested when the user has some technical expertise and have some experience with these inbuilt utilities. Therefore it is recommended to use a professional tool for an easy and effortless fix of error. You can refer to the beginning section of the blog for an automated solution.